Often when I get to the final step of creating a quilt, finishing the edges, I tend to slap on the usual double fold binding and leave it at that. However, there are alternative edge finishes, and I’m on a mission to try them out. 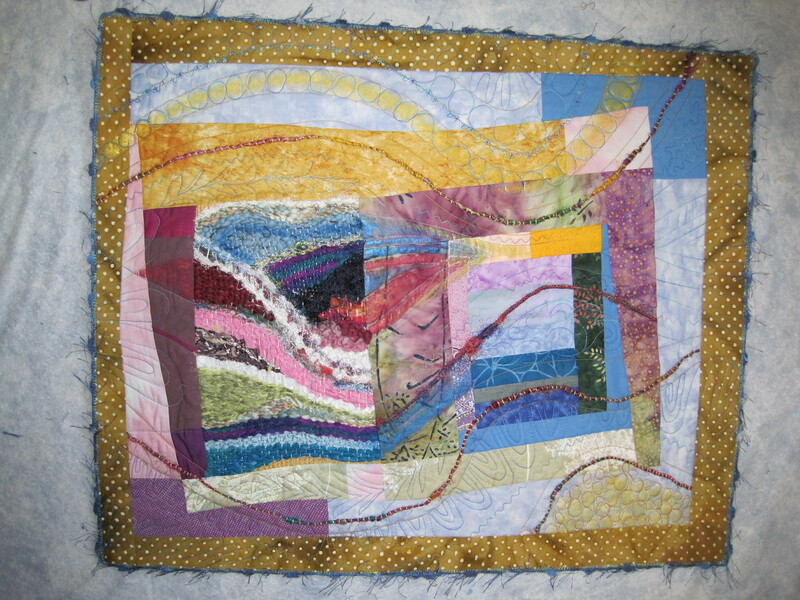 Most recently I attached funky yarn to the edge of an experimental quilt using a method Wendy Butler Berns describes on page 32 in the Projects 2006 issue of American Quilter. The yarn came from a scarf knitted for my son by a former girlfriend. With his OK, I unraveled it and now have lots of eyelash type yarn to play with. SQ is also cheap frugal . There are several variations on this method – using rattail cord, perle cotton, etc., but essentially the edges are finished with a zigzag or decorative stitch and the yarn/cord is snugged up next to the edge and zigzagged on. 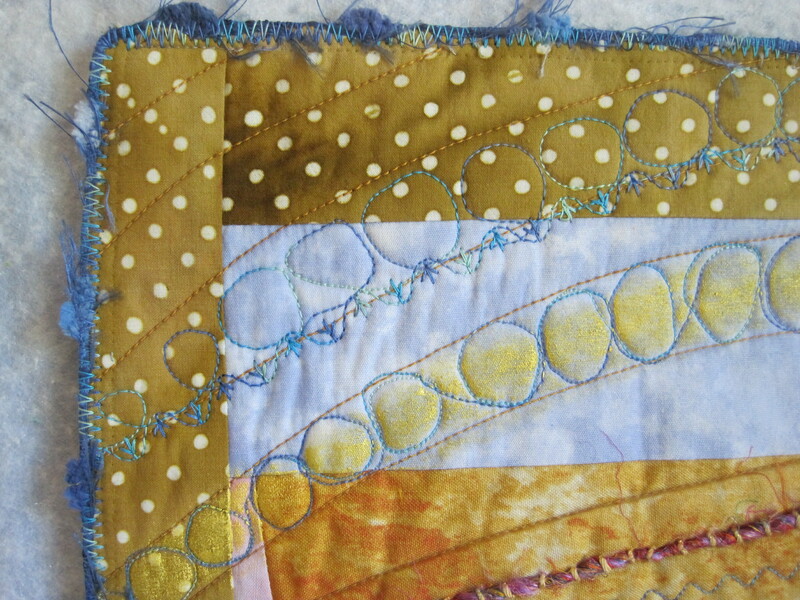 LuAnn Kessi uses a decorative stitch around her edges. (I just love the name of her blog – May Your Bobbin Always Be Full. Maybe someone can compose a Quilter’s Blessing – May your points always be sharp, May your seams always meet, and May your bobbin always be full.) I gather the corners can be tricky but here’s a method that Terry Grant uses to tame them. Of course, you can just satin stitch around the edges. Here’s how Gerrie Congdon does this. I notice she sews opposite sides rather than stitching continuously around the edges. 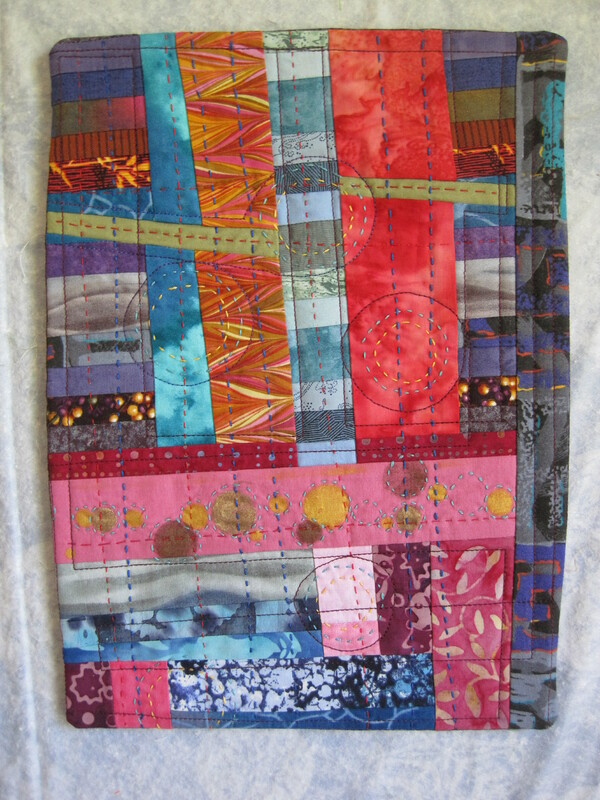 For small contemporary or art quilts, a facing sewn to the back can give a sleek, modern finish. There are lots of variants on how to make such a facing, but the most common advice is to keep fabric from bulking up at the corners. 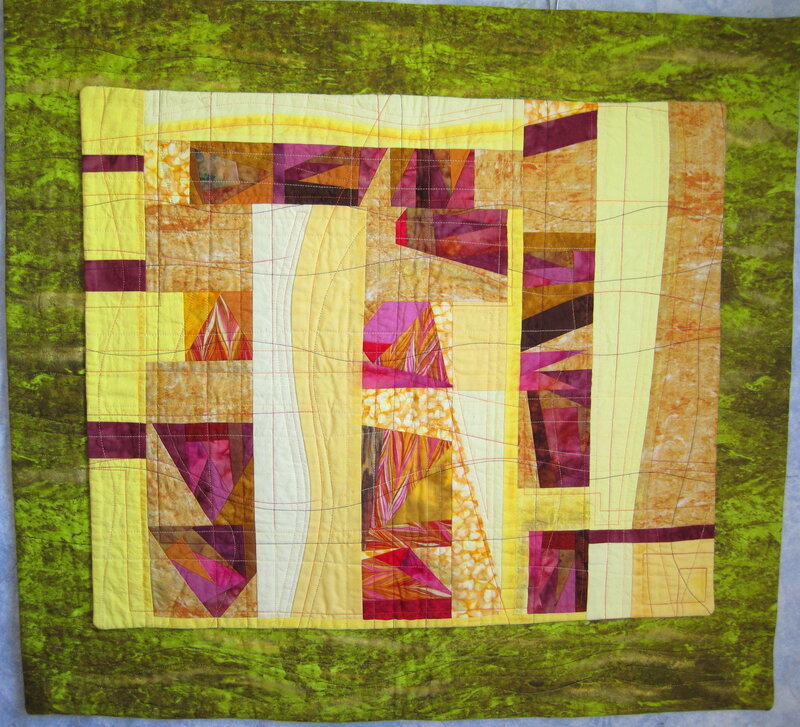 I used this method on the assemblage below, which I hand stitched before I machine quilted it. Nuance alert – if you hand stitch through the top layer only your stitches will sit on top of the fabric; if you stitch through top, batting, and backing they will sink into the fabric. Yes, I’m a slow learner. One extension of the facing method is to make another, slightly larger whole cloth quilt and sew the smaller quilt to it. Jean Wells calls this a portrait finish. I hope the picture below will give you a better idea of this arrangement. Yet another way to finish a small quilt is to glue or sew it onto a blank artist’s canvas after finishing the edges by one of the methods described above or binding them. You paint the side edges of the canvas with acrylic paint so you don’t have blinding white edges. This technique can give presence to a very small piece that might otherwise seem like a fancy pot holder. Which method to use? That depends on how your quilt will be used. For daily use the tried and true double fold binding is probably best. For a wall or table quilt one of the alternative finishes might add that extra touch.